Gum disease is the swelling or soreness of the gums (soft tissue) around your teeth. It is caused by bacteria in plaque, a sticky, colorless film that forms on your teeth. The plaque bacteria produce toxins that can lead to inflammation of the gums called “gingivitis.” This initial stage of gum disease is reversible. However, if you do not remove plaque by brushing and flossing of your teeth, it can build up and infect your gums, teeth, and the bone that supports them, leading to a more severe form of gum disease, periodontitis. 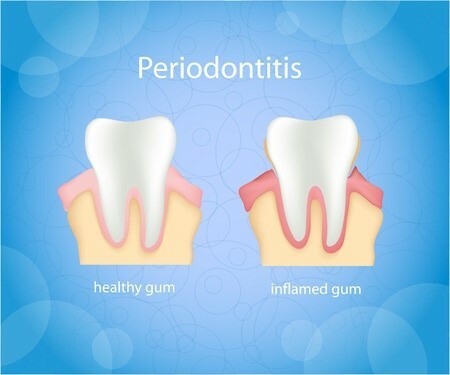 If left untreated, periodontitis can result in the loss of bone and teeth. The signs of gum disease are not always easy to see and can be painless. The earlier gum disease is caught, the easier it is to treat. That’s why it’s important to see Dr. Jeturian regularly.